Are you developing Silverlight apps that would like to talk directly to Windows Azure APIs? That is perfectly legal, using the REST API. But if you want to use the handy-dandy Windows Azure Managed Libraries – such as Microsoft.WindowsAzure.StorageClient.dll to talk to Windows Azure Storage – then that’s not available in Silverlight. Okay – so maybe it doesn’t exactly – the Target Platforms list is empty – presumably an error of omission. But going by the Development Platforms list, you wouldn’t expect it to work in Silverlight. This entry was posted in Azure, Cloud Computing, Programming, Silverlight and tagged azure, error, Silverlight on October 8, 2010 by Bill Wilder. According to RIAStats, a version of Silverlight is now detected on more than half of the browsers sampled! This is a telling milestone as installations of Silverlight continue to grow – drawing inexorably closer to that of Adobe Flash which currently enjoys installations on around 97% of browsers. If you look at the graphic, and you consider the “not detected” section, it reads 49.99%, which means that the sum of those detected is better than half. At PDC 2009 in November, Scott Guthrie announced that Silverlight penetration was up to around 45%, up from around 30% in the summer. These RIAStats numbers feel in line with that. Of course, I know this doesn’t “prove” Silverlight is really on more than 50% of browsers, as RIAStats are not a perfect reflection of the web as a whole, but it seems an interesting milestone nonetheless. 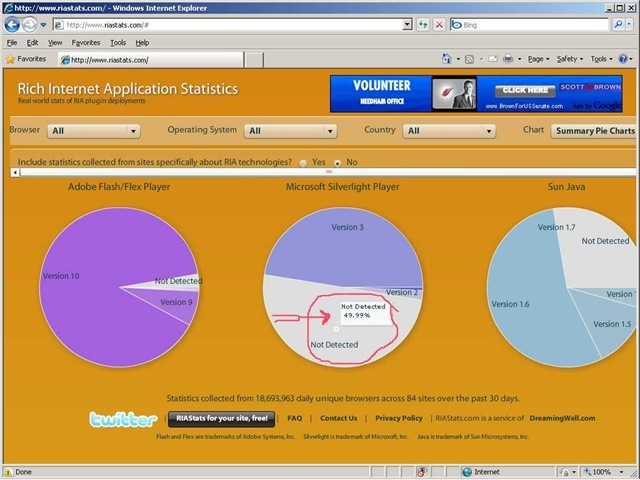 Silverlight has been in the wild for 863 days: Silverlight was released for real (RTW, or “released to web”) on 05-Sep-2007, followed thirteen months later by Silverlight 2 RTW 14-Oct-2008, then less than nine months later we saw Silverlight 3 on 09-July-2009. Silverlight 4 is in beta – maybe Microsoft will announce its release at MIX10 in mid-March? If they do, that would be on a similar release rhythm as from Silverlight 2 to Silverlight 3. I’m not sure why they don’t agree – perhaps differences in sample sizes, sampling methodology, or due to different audiences being sampled. Also, if you check the math yourself, you’ll see the values shown don’t tie down perfectly for RIAStats (though they do for StatOwl); if you add up the individual Silverlight versions along with the Undetected, you won’t get exactly 100%. Some sort of rounding errors I assume. [EDIT: See explanation in Comment from Travis Collins, RIAStats creator.] But I also assume that the Undetected = 49.99% is most likely right (at least not wrong due to a rounding error, since it is harder to round wrong there). EDIT 01-Feb-2010: Found an interesting, relevant post on Cool facts about Silverlight penetration / mindshare from UXPassion.com. This entry was posted in Programming, Silverlight and tagged Silverlight on January 14, 2010 by Bill Wilder.